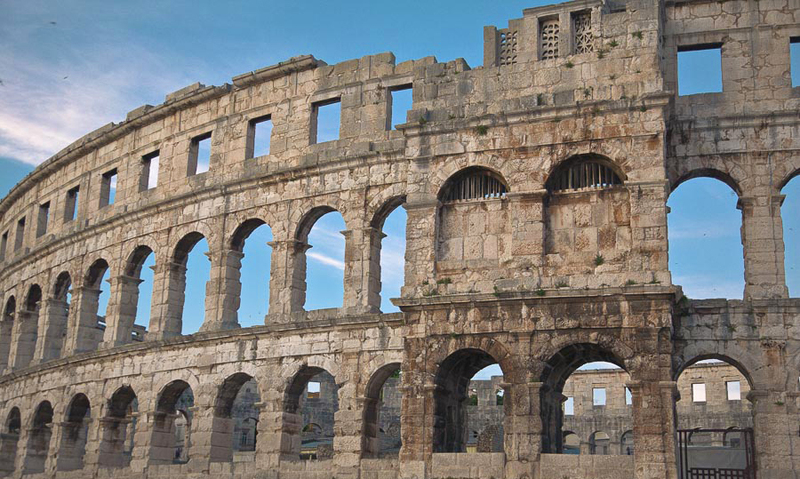 Today, it is the venue for many different events – Pula Film Festival, various concerts, opera, ballet, sports competitions… since its capacity is about 5000 spectators. Every week during the summer months, the Arena hosts gladiator fights as part of the historical and entertainment spectacle “Spectacvla Antiqva”. The underground passages, once used by the gladiators, nowadays host a regular exhibition of viticulture and olive growing in Istria in ancient times. The exhibits include reconstructions of machines once used for the production of olive oil and wine (mills, presses, vessels) and amphorae used for storing and transporting olive oil and wine. The Amphitheater is situated outside the old city walls because of its size and geographical configuration. The road that leads to the center was constructed during Emperor Vespasian, after whom it was named – Via Flavia. Even today it represents one of the main city roads.